On Tuesday John (my husband) and I stopped at the drug store after the gym and got some chocolate truffles. We've bought candy a few times since we started working out, when I'd track a workout and realize I had more calories to spare than I'd anticipated. My favorite kind of math. It all worked out well on Tuesday, but then on Friday I ate all the chocolates that were left. I'm not sure what led me to do that - maybe I was de-stressing from the week, maybe I was bored, maybe I was feeling like some self-sabotage. Not surprisingly, I felt guilty over it and angry at myself, and that quickly led to writing off the rest of the evening. Might as well grab a handful of chocolate chips. I knew this was the worst kind of trap to fall into, letting one non-ideal food choice lead to another. During these delightful times, I try to focus on the best piece of weight-loss advice I ever got. It's something that I still struggle with, but am continuously working on. When I eat something that isn't part of my weight-loss or general healthy eating plan, I try to forgive myself. Immediately and unequivocally. You should, too. Whether you ate an extra brownie, or an entire jar of frosting, it really doesn't matter. Assuming you didn't eat the last of an endangered species or a still-steaming and possibly animated pie you stole off somebody's windowsill, the only person you've affected is yourself. And not that much, probably. Perhaps you've made a mistake, but you're human and it happens. You ate it; perhaps it wasn't the best choice to make, and it may even put you over your calories for the day or make you bloated tomorrow, but feeling guilty over it will accomplish exactly nothing. 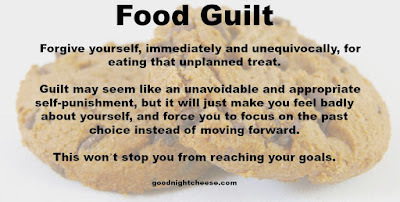 Guilt may seem like an unavoidable and appropriate self-punishment for eating something off your plan, but it will just make you feel badly about yourself, force you to focus on the past choice instead of moving forward. All that will make it more likely that you'll make additional negative food choices, choices you might not have even considered otherwise, which could in turn lead to more guilt and more food. This is something with which I still struggle, but I think just acknowledging and reminding myself that I don't need to feel badly helps. On Friday I ate the chocolates and the chips, but on Saturday I tried to get right back to it, and make and enjoy reasonable food for the rest of the day. 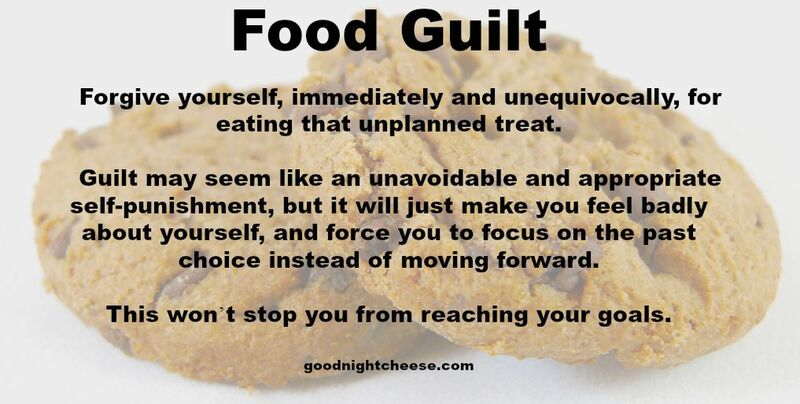 That not-feeling-guilty also means not punishing myself by eating less later, even if I technically "deserve" it. In general, even if that initial pie or whatever has already used up most of my allotted daily calories, the only adjustment I am willing to make to my eating is to skip dessert (because I've already had it). I will not skip meals or eat lettuce for dinner and go to bed hungry, even if that would allow me to "make up" for the pie and get that magical 500-750 calorie deficit, because that would be punishing myself. Instead, I accept that perhaps this won't be a calorie deficit day, and that's not the end of the world. My goal is to not allow any single bad decision to spiral into more, and to just wake up tomorrow and keep going. I need to print this post out and hang it up all over my house! I struggle with food guilt all the time, and I throw in the towel far too easily. Awesome post--We all sometimes need a reminder not to beat ourselves up just for what we put in our mouths. I'm glad you liked it! I learned this lesson the hard way, when last year I let a few less-than-healthy weeks spiral into a 30-pound gain. I attribute a lot of that to a cycle of feeling badly about how I had slipped, which would lead to a "why bother now?" attitude and more unhealthy choices. Its been a great info you shared here and I love it a lot. Thank you, I'm glad to hear you enjoyed it! Phen 375 helps your energy level all things considered. The common substance compounds in it help your body to deliver more energy and furthermore program your body not to utilize energy so quick. This is critical in light of the fact that you can do significantly more physical work without getting worn out. As I specified before, always check with your doctor or Weight Loss consultant with regards to the security of assuming Weight Loss Pills. In the event that you have any medical problems, it may not be the proper thing for you. Somebody with heart conditions would in all likelihood not have any desire to go this course to shed pounds. It would accomplish more mischief than great. In the event that you are healthy https://www.phenqultimate.com/, your doctor will no doubt enable you to choose which Diet Pills to utilize.